We went to the zoo on Saturday; our first trip in a long time. Clouds and the threat of ran kept most people away. 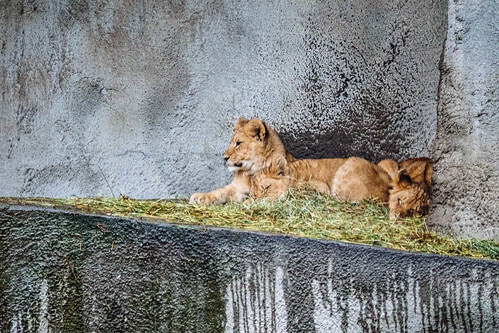 I wanted to see the zoo’s new lion cubs. Patrick’s the one who spotted them first: All asleep in a ball in the edge of their enclosure. Disappointing — I was hoping for frolicking. Make sure you look carefully. There are three lions in this photo. Of course we stopped at the Zoomazium so the kids could play. 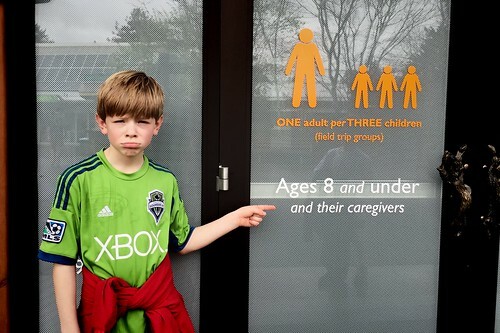 There, Alex discovered that growing up has its downsides.